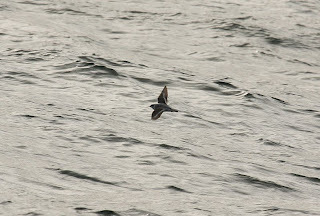 Although I hadn't expected to see many birds in August I was aware that there might be a possibility of some good seabirds, even a Wilson's Petrel, on one of the short evening 'pelagics' out of St Marys. I hate feeling seasick and was resigned to the fact that I would never have Wilsons on my list. Even the thought of wallowing about in a relatively small swell was enough to make me feel quite nauseus. So as the week went by and the strong South westerlies continued to batter the islands the prospect became more remote. However, a message on the pager saying there would be a pelagic on the Sapphire that evening and a distinct improvement in sea conditions raised the shall I shan't I issue again. If Iwas ever going to see Wilsons this was the chance. I took my pills at 3.30 and the die was cast. The Sapphire left the quay at St Marys at 5.00 pm with Joe Pender at the helm. There were 7 other birders, one lad Shark fishing and a couple of crew. It was a pleasant evening, the wind had thankfully dropped off and a hazey sun was starting to sink. I was starting to feel confident as we passed the Spanish shelf. 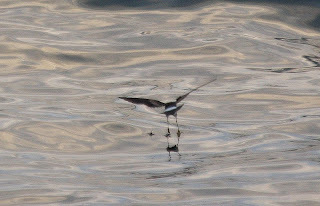 Apart from a couple of Fulmars the first bird of interest was a Grey Phalarope which flew past us and promptly sat on the sea. After about an hour the crew started to fish for Mackerel and the three rods were soon reeling them in 3 or 4 at a time. After another 30 minutes or so we started to chum, a foul smelling concoction of rotten fish, bread and oil was tipped over the side or hung in sacks from the boat to form a slick. The engines were cut and we drifted leaving the slick trailing behind us. 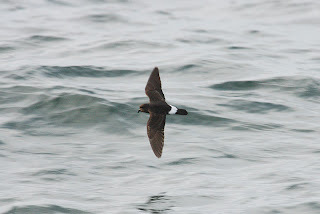 A few large gulls were first to appear and then one or two Storm petrels appeared from nowhere. The boat was now wallowing in the swell and the sea sick pills were being tested but with things starting to happen I felt OK, just. 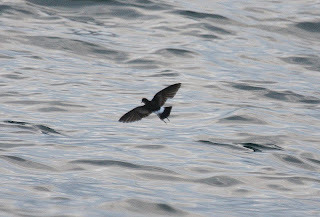 More Stormies appeared a few Manx Shearwater and an occassional Bonxie but no big Shearwaters and no sign of the bird I really wanted to see. Perhaps conditions were too good. 'Wilson's' - the shout went up. I needed have worried. 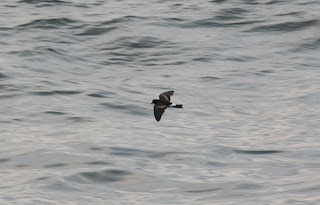 I soon had the Wilson's petrel in my bins as it flew round the boat, heading for the slick. Fantastic, well worth all the anxiety etc. The bird stayed with us for some time with at least one other Wilsons joining it at one stage. 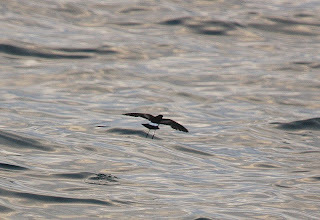 The difference in size with the Storm petrels was obvious but the other features were also clear as the Wilson's danced on the water 30 metres away. About 3 of us were clicking away with our cameras but with so much moment of the small boat and the light fading fast I wasn't very hopeful. Maybe a record shot as they say. We were distracted from the Petrels when Joe suddenly grabbed one of the rods and struck hard, there was clearly something quite big on the other end of line. Joe handed the rod to the single fisherman on board who spent over 25 minutes pumping the rod to get whatever it was to the surface. Finally the Blue Shark appeared at the surface and was lasooed with a wire and dragged on board. It was photographed, measured (about 7 foot) and tagged before being returned to the depths. 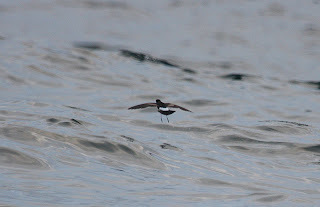 So a successful trip for everyone and an interesting experience on my first and last Pelagic.